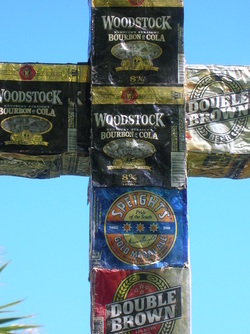 In a quest to bring attention to the senseless deaths on our roads by people who think they have a right to drink and drive, I have covered a 2.4 metre cross with discarded alcohol cans collected from along the verges of Makarau Road, a quiet country road in Rodney where I live. My analysis of the cans reveals that in these parts Woodstock Bourbon and Cola is now the favorite beverage of the drink, driving public! The installation features a 2.4 m high by 1.3m wide cross covered with flat sheets of the collected aluminium cans covering the wooden structure. The cross is sited in a patch of rough regenerating scrub that looks very much like our unkempt country roadsides. There are numerous squashed and run over cans lying in the bracken, as if tossed from the passing cars. A glass jar containing a dead bunch of flowers is placed at the foot of the cross, a silent reminder of the people left behind to mourn the death of their loved one.